Duck hunters hunt Specklebelly Geese due to the birds responsiveness to calling, decoy placement and the appeal of obtaining a trophy bird. The 4 to 6 lb. trophy bird is casually referred to as a “Speck” or Specklebelly and is also known as a greater white-fronted goose. This bird derives its name from the white patch (rings) behind the bird’s bill. A mature Specklebelly is distinguished by random black bars across its breast and the older bird has more significant black feathers. Although Specks feed in the same fields as other geese, Specks often appear wilder, more wary and are more difficult to approach. The sound of a Specklebelly is also distinctive. The bird often makes sounds similar to a high-pitched laughter. The Speck also makes unmistakable clucks and yodeling sounds. There are many difficulties facing a hunter who wants to hunt the prized Specklebelly. Difficulties, which include considerable scouting time and modest daily limits, can deter many hunters from pursuing this type of geese. However, Specklebellies can be fairly predictable when habitat conditions remain the same. Birds select feeding fields or marshes randomly, but generally, continue coming back to the same area until the food supply is depleted. Tip: As geese can damage winter crops, some farmers will allow hunting on their fields. If you scout a great hunting area on private land, ask the land owner for permission to hunt. Make sure you have a detailed plan on how you will hunt and how you can help protect their land. Although Specklebellies tend to gather in small groups at the edge of other goose flocks, goose decoy spread and amount of decoys will depend on location, preference, concealment, and your calling ability. In general, while hunting Specklebellies, the hunter can use the same decoys as used with snow geese. Although when possible use full body decoys. Don’t space decoys too tightly; leave the impression of a relaxed feeding flock. Make sure to segregate speck decoys from duck decoys and snow goose decoys. As specks move in smaller bands, 12 to 18 Specklebelly decoys may lead to a successful hunt. However, later in the season 2 to 6 speck decoys may also lead to a successful hunt. Many hunters have learned that calling ability is more important for Specklebellies. Specks are thought to have better eyesight than mallards. It might be because they fly longer in a straight path. As a result, the slightest movement can divert the incoming Specks. Using a layout blind may be the best option as Specks like to be 50 to 75 yards away from a line of trees or shrubs. Remember to place any decoys upwind of your blind. If you want to hunt a larger number of hunters in a particular area, you will need more cover. But if little cover is available, increase the number of decoys. Many hunters have learned that calling ability is more important for Specklebellies. Hand Position – Grasp the end of the call loosely between your thumb and index finger. Curl your remaining fingers into an open “C” shape. As you blow into the call bring the tip of your finger over the exhaust until the reed breaks over. This is the correct position to provide the proper back pressure to successfully operate your Specklebelly calls. Cup your other hand over your call hand to direct the sound. The best way to learn how to call with a Specklebelly goose call is to get in the field and talk with the geese and copy their sounds. Calling Specks means paying attention to the birds and learning what causes them to respond. Don’t stop calling when the Specklebellies are in close range (“just shy of gun range”) tone the yodels down and add in some clucks. 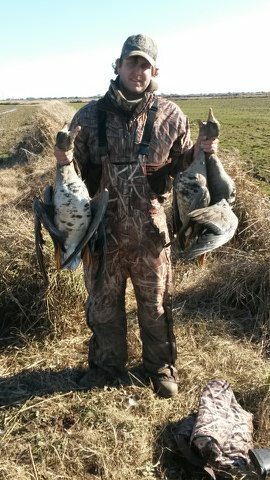 The call can successfully pull in speckled geese to the rice fields and marshes in Arkansas, Louisiana, and Texas. Many hunters see Specklebellies as a trophy bird. The meat of a Specklebelly is considered by many to be better than any other geese and is compared to that of the Green Winged Teal. Thank you for taking the time to read this article. Lover of hiking, nature, camping, bird calls, and more. I run ATO and do my best to provide interesting information for my readers to help make their outdoor adventures more fun.